Dad was born nearly a century ago. It’s amazing when you think of it that way. February 25, 1919 in Seattle, WA to be exact. Over 99 years ago. The fifth of seven siblings born to Hisakichi and Kono Kanemoto, both legal immigrants from Hiroshima. …but Dad passed away quietly at 99 years of age on Good Friday, March 30, 2018 in Los Angeles, CA – at the same facility where his older sister, my Aunt Shizue, passed away just a few years earlier at 95. 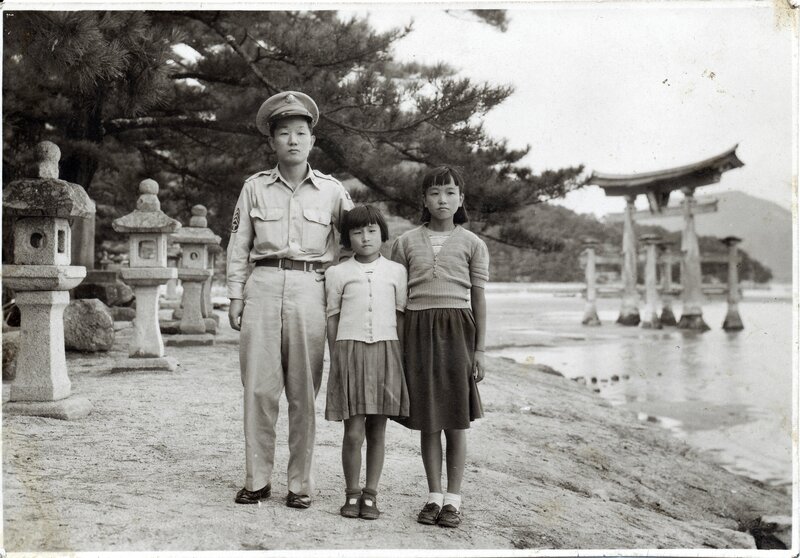 Dad on left, somewhere in Seattle with his father Hisakichi and older sister Shizue. Circa 1920. Dad at right with Grandpa Hisakichi and Aunt Shiz near their barbershop on King and Maynard, Seattle, WA. Circa 1922. Dad at far right. 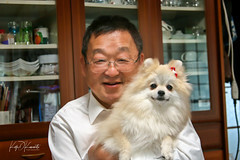 Grandfather holding Suetaro with Shiz holding a precious doll. Circa 1923, Seattle, WA. Dad second from left holding what appears to be a rice ball in front of their Seattle barbershop. Far left is Suetaro; to his right is Aunt Shiz. Circa 1924. From left clockwise: Grandmother Kono, Suetaro climbing on chair, Dad with cap, Shiz, Mrs. Fujii and her son (?) and the youngest Kanemoto, baby Mieko who would pass away at 15 years of age in Hiroshima. Circa 1925, corner of Maynard and King Streets, Seattle, WA. My guess is circa 1925; the youngest sister Mieko appears to be about two years old. Dad on left, Uncle Suetaro is the boy in the center (KIA as a sergeant of the Japanese Imperial Army on Leyte October 1944). By 1927, all but the oldest boy (Uncle Yutaka seated on the left) would be living in Hiroshima. Only two would return to the United States before the outbreak of war. Of those left in Japan, only my Grandma will be alive by war’s end. This was taken in Seattle. The finish was heavily soiled by oils left by those who handled it decades earlier and could not be smoothly removed. This is the first and oldest known photograph taken of my father’s Hiroshima home, still owned today by the Kanemoto family, circa 1928. Dad is the third from the left. The photo includes all of my dad’s siblings except for his oldest brother who had returned to Seattle and another brother who died at two years of age in Seattle. The house was damaged by the atomic blast. Dad on right next to his favorite brother, Suetaro. It is a tiny picture, about the size of a quarter, and it fell out from behind a larger picture glued in place in Granmother Kono’s photo album. Taken in front of family home in Hiroshima. My guess is 1928. Dad is second from left, fourth row back in a lighter uniform, in a class photo at his Hiroshima high school, Nichu. It was totally destroyed by the atomic bomb. Sadly, the odds are tremendous all of his classmates were killed or wounded in the war as was his brother. Up to a few years ago, he still remembered perhaps six of his classmates pictured. Dad was the last to pass away. Likely 1936. I think of all the pictures of Dad spanning 99 years, this is the happiest I’ve seen him (right), posing at his Hiroshima home with his two younger siblings. 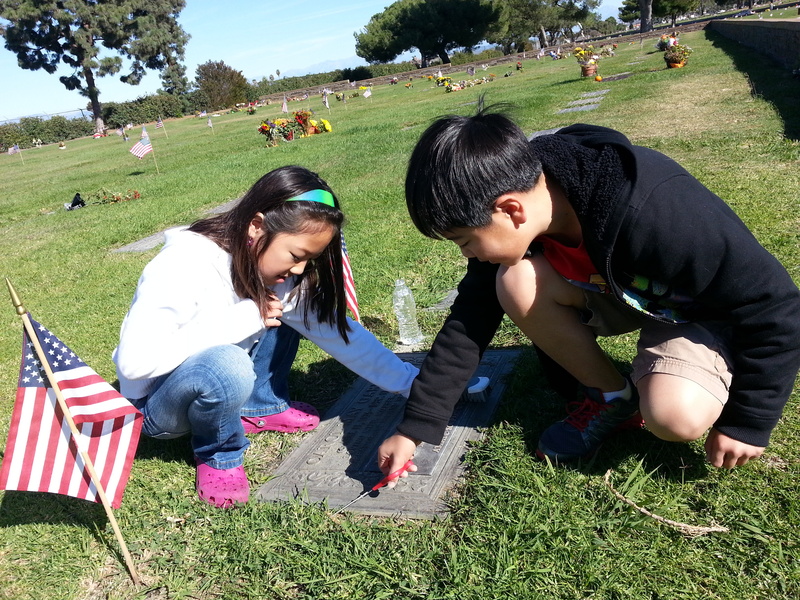 Both siblings would pass away before the end of WWII. Circa 1936 is a guess. Dad on his high school track team. He was a track star! Dad is in first row center, in white cap. A page out of his Hiroshima high school’s yearbook: Dad in his senior high school portrait, bottom right. As verified by his predecessor high school administrative staff, he was the last one still living as of three years ago. He would return to Seattle after this. 1937. Dad showing off his pride in his varsity sweater in front of his brother Yutaka’s home on Fir St. in Seattle. Likely taken between 1937 and Pearl Harbor. Dad (standing) with his sister-in-law and my Aunt Haru and his oldest brother Yutaka holding his first son Seiichi Robert. Robert would die at six years of age at the Minidoka prison camp in 1944. All would be imprisoned three years later by President FDR, a Democrat. Taken in Seattle 1938. Dad’s draft card that classified him as an Enemy Alien (4c). Ironically, he had to carry it around in his wallet at all times while imprisoned at the Tule Lake and Minidoka prison camps – therefore the crease. 1943. Dad preparing to ship out to Japan with the rest of his US 8th Army Military Intelligence Service buddies. He was one of the first graduates of the now US Army’s Defense Language Institute Foreign Language Center. Presidio of Monterey, November 1947. Dad somewhere in Occupied Japan, March 1948. Dad on his fateful day. Poor guy. I never heard him talk back to mom… ever. Tokyo February 1951. When Dad (at right) took mom to meet his Hiroshima relatives – including my Grandma (circa 1951). I can sense the tension between aristocrat Mom and coubtry woman Grandma Kono! LOL His mom would pass away in 1954, his oldest sister Michie (center) in 1963. All were survivors of the atomic bomb. Likely taken soon after their wedding in 1951. Dad, mom, Aunt Eiko, Grandma and Grandpa. Notice the heavy metal 16mm Bell & Howell movie projector. I remember using it in Los Angeles as a kid. Tokyo. Dad of left with mom and Grandpa. I’m the kid. May 1956 – Tamagawa Park, Tokyo. Dad in yellow sweater with some of mom’s Nisei friends. My guess is circa 1969. My guess also is that they have all passed away. East Los Angeles. Dad still wearing that yellow sweater! His first new car (now eight years old in the picture) – a 1963 Mercury Meteor Custom – behind us at LAX, picking up Aunt Eiko and Uncle Paul (also a US 8th Army MIS veteran) who flew in from Tokyo. May 1971. Dad with his older brother Yutaka and oldeer sister Shizue. Best guess is 1985, location unknown. Dad (R) returned to Hiroshima for a vacation in 1997; Masako is in the center. This was taken at his family home. Notice the stepping stone; it is the same one Masako stood next to in a picture taken in 1948. Sadly, this would be his last time in his beloved Hiroshima. Dad actually “died” on his birthday in 2010 when he slumped over just before eating lunch. My oldest daughter Robyn (back to camera) saved the day by jumping in then shaking him until his heart started beating again. What was funny was after starting to breathe again after about a minute, he had no idea anything happened. Paramedics tend to him. Irvine, 2010. Dad in 2012 deciphering the names written on a captured Japanese battle flag from WWII. Some of the people who came across my WWII blogs contacted me about such souvenirs their grandfather’s brought back from the Pacific; they were hopeful Dad would be able to read the key names and village from where the deceased Japanese soldier came from in their attempts to return the flags. I thought it good for him, just to keep his mind active. Truthfully, there aren’t many left who can read these old characters. Not even my mom or aunt could read them. Dad reads them like he was 18 years old. 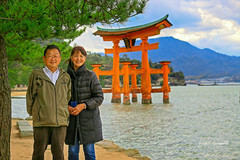 This will be the last time Dad and his older sister Aunt Shizue would see each other. She would pass away quietly a short time later at the age of 95. Dad would pass away at the same facility. Dad in center at my oldest daughter’s wedding, January 2013. Photo courtesy of Toyo Miyatake Studios. Although 96 years of age, Dad meets his only great-grandchild Emi. I think everyone was scared he was going to drop her. 2014. 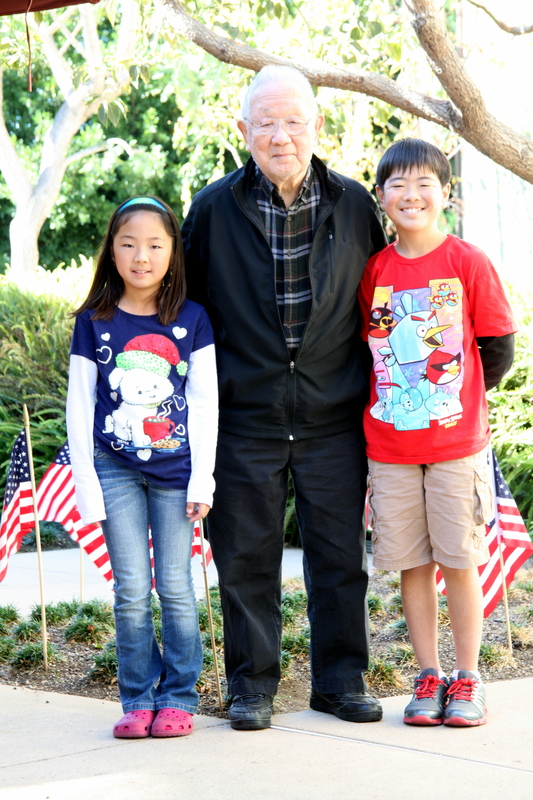 My last picture of Dad, flanked by my two youngest kids, taken on his 99th birthday last month. Yes, he is smiling because he got to eat his favorite sweet, “Odango”. February 2018, Los Angeles. Dad, I wish I were a much better son… but I know you are joyfully back playing “oninga” or jump-frog in front of your Hiroshima home with your favorite brother Suetaro. I hope you have all the odango you can eat now. You will be forever young. It is hard to believe thirty years have passed since President Reagan commemorated the 40th Anniversary of D-Day – in person. I feel his love and support for our military – and Nancy – is without question. But few people recall that President Reagan gave not one, but TWO stirring and emotional speeches that day at Normandy. The first and most replayed speech was the one at Pointe du Hoc, flanked by surviving soldiers of the United States Army Ranger Assault Group. I pray in my own way for those young souls who were killed – on both sides – as well as their families. We will not see a mass of humanity assembled for such purposes ever again…and the remaining representatives of that humanity are leaving us each day. That was Mr. Johnson’s reply while I was driving us to Old Man Jack’s funeral. I had asked him to help hold me together as I knew I would fall apart. Old man Jack on the left, Mr. Johnson on the right. Taken June 30, 2005. Mr. Johnson was Old Man Jack’s next door neighbor. Nearly SIXTY years. Hell, I ain’t that old yet. Well, I’m close. They got along real well for those 60 years… except Jack was a WWII sailor… and Mr. Johnson was a WWII Marine. They reminded each other of it often. And Mr. Johnson was a decorated WWII Marine. Decorated twice…that I know of. I never did call him Johnnie. I just couldn’t. But in the end, we found out his real name was Doreston. Doreston Johnson. Born August 1, 1923 in Basile, Louisiana. A tiny town, he said, and everyone was dirt broke. I wish I knew why he wanted to go by “Johnnie” but later, I discovered Doreston was his father’s name. After Jack passed away, I visited with him. He opened up a bit. When war broke out, he was gung ho like many young boys at that time. It was expected. You were branded a coward if you didn’t enlist or eluded the draft. You were at the bottom of the heap if you got classified 4F. He said went to the Army recruiting station. They said they met their quota, couldn’t take him right away and to try again next week. He then went to the Navy recruiter. They also said pretty much the same thing but that there was an outfit “over there that’ll take ya”. It was the United States Marine Corps. 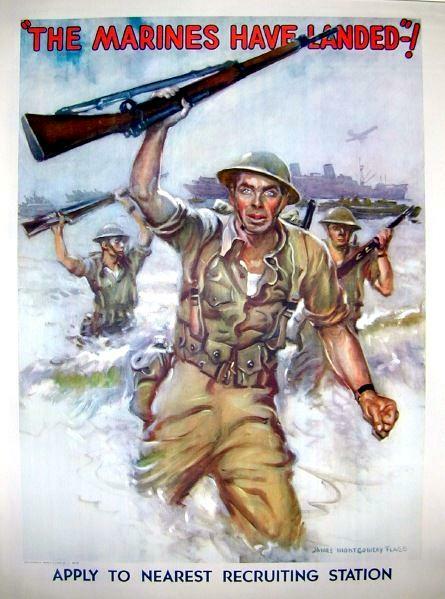 Notice the 1903 Springfield in this 1942 recruiting poster. The Marines “took him”…right then and there, he said. Mr. Johnson said, “I was a dumb, stupid kid at that time” – slowly shaking his head…but with a boyish little grin. It was 1941… When the United States Navy had their backs against the beaches… MacArthur blundered after Pearl Harbor and thousands of soldiers were taken prisoner in the Philippines. The country’s military was poorly equipped and poorly trained. With outdated equipment like the 1903 Springfield and the Brewster Buffalo. And most gravely, the US Navy was outgunned. Mr. Johnson was in for it. At times, I mix in Memorial Day with it… I don’t think there’s anything wrong with that. They will always be veterans in my eyes. 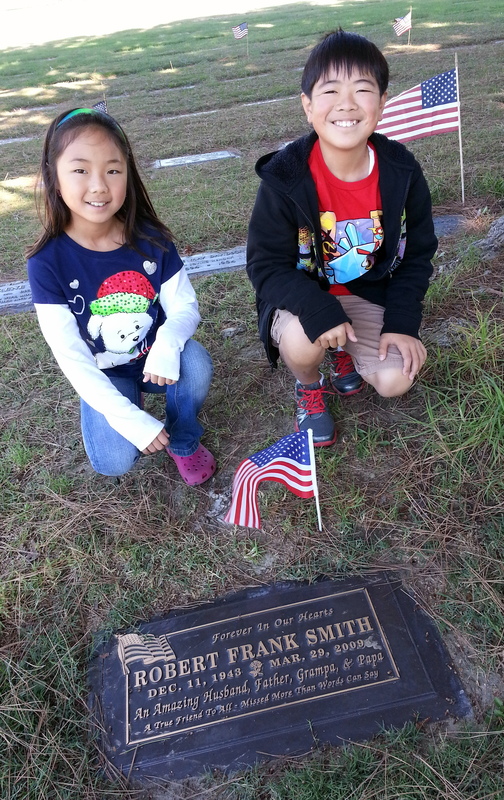 He was part of the US 8th Army’s Military Intelligence Service and served during Occupied Japan. Being a “kibei”, he translated during the War Crimes trials, interrogated Japanese soldiers being released by Russia, Korea, Manchuria and China and translated Japanese war documents for intelligence. Went to pay our respects to Old Man Jack. Sun was just too low in the sky for a good pic… 😦 Miss you, Jack. And went to see good ol’ Bob, too… What a kind, great man he was. One of the few times Old Man Jack would tell me what island something happened on, it would be humorous – as humorous as he could make it. He HAD to laugh off some of the horror. He needed to survive being under attack by his own thoughts. On January 16, 2011, eleven months before he passed away, we decided to go to Denny’s for breakfast. He hated that place – except for their (gawd awful) coffee. He loved their coffee. And he complained about the coffee on the islands. Imagine that. Denny’s coffee couldn’t have tasted that much different. Denny’s uses ocean water, too, you know, for their distinctive flavor. Perhaps that is why he liked their coffee. 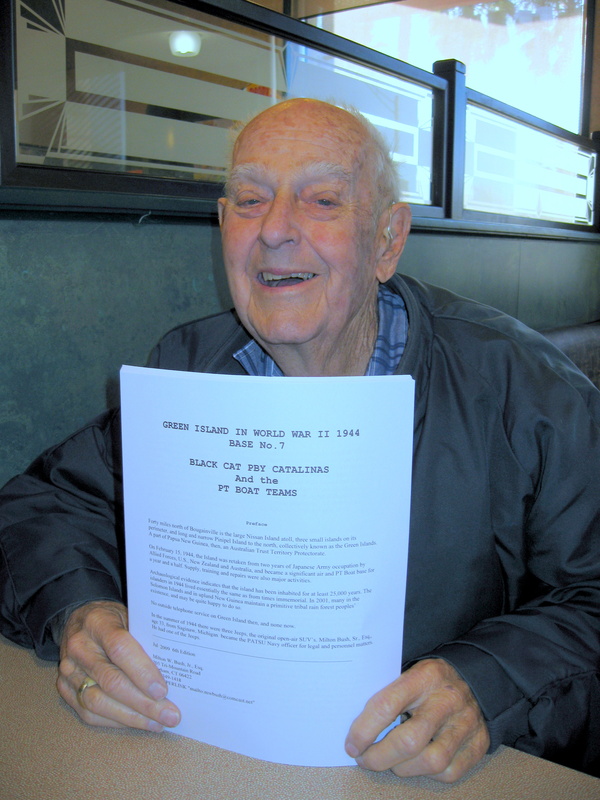 Jack with “Green Island” story and his tradmark grin – Jan. 16, 2011. “Green Island” was Jack’s last combat station when he earned enough points to be rotated back home. He told me when they yelled out his name, he just ran straight onto this makeshift pier where a PBy was starting up. He jumped in wearing only his shorts and boots. They took off. He was on his way home. Well, you can see his reaction. He was “tickled and pickled” I went through the trouble. During breakfast, he told me about one detail he was assigned to on Green Island – the digging of new holes for latrines. Never mind my eggs were over-easy. But he’s gone through hell whereas I was spared. This was everyday fare for him. He told me he picked out two “dumb new guys” who thought they knew everything for the detail. They went out where the other “used up” latrines were. He ordered them to start digging new holes in this hard coral-like stuff not too far from the other “used up” holes while he “supervised”. I knew I would get his goat if I interrupted him. That was part of the fun. So I interrupted him. For fun. Well, I asked for it… in Denny’s… on a busy Saturday morning. Whooo-ee. That was fun… in Denny’s… on a busy Saturday morning. I never asked him if he read the history on Green Island. Later on, though, Old Man Jack said he had wanted to go back to those “stinkin’ islands” just to see. It felt as if he wanted to let some demons out. He never made it back. Perhaps he’s there now saluting his young buddies he had to leave behind.